Click here to visit this course's website. Note: This course newly opened in 2016 as The Club at Sunrise. We will provide a pictorial review of the course in May/June 2017. 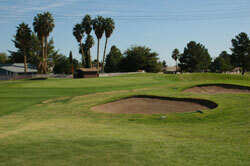 The photos and review below reflect the original Desert Rose Golf Club. 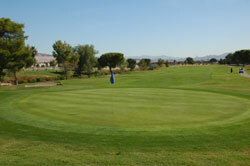 Desert Rose Golf Club in East Las Vegas is one of the area's best golfing values. The course features three sets of tees that play to 6511 yards/118 slope, 6135 yards/116 slope and 5458 yards with a slope of 115. As the slope ratings indicate, this is a player friendly layout that can be enjoyed by all levels of golfers. The facility includes a grass/mat range, a putting green and two chipping areas, plus a clubhouse with small pro shop, and a restaurant that serves breakfast and lunch menus. On course 150 yard stakes are located in the fairways on all par fours and fives, and 100, 150 and 200 yard blocks are measured to the center of the green. Color coded flags indicate front, middle or back hole locations. 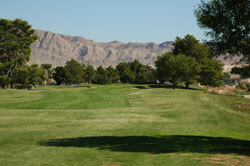 The course is conveniently located just minutes from Las Vegas. Golfers will find ample fairways that are often bordered by long canals that run parallel to the hole designs, with a couple of ponds also located greenside on holes two and three. Mounding and bunkering often come into play greenside - with some deep lipped sand traps (pictured above) providing incentive to approach these mildly undulating putting surfaces with accuracy. 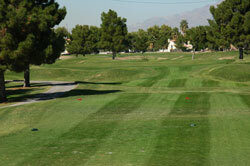 As with many Vegas area courses, the roughs here are not over-seeded, resulting in the brown, dormant look during the winter. These surfaces are very playable. 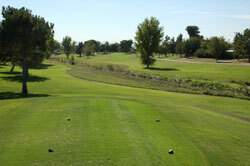 The par 71 layout features includes 4 par fives and 5 par threes (the par three 3rd and 9th are pictured below), with a group of par fours that measure between 341 and 455 yards in length. 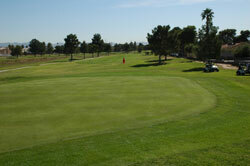 Water comes into play prominently on just 2 holes - but canals await on the perimeters of 13 other holes. For those visiting on a golf vacation, Desert Rose is a good warm up round, and also is a nice supplement for those wishing to include a value round or two in their golf itinerary - as golf in Vegas can put a reasonable dent in one's pocket book. For more info on Desert Rose - click here. 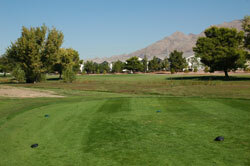 Las Vegas Golf Course Reviews - Copywrite©1999-2019. Two Guys Who Golf (1370041 Ontario Ltd.). All Rights Reserved. 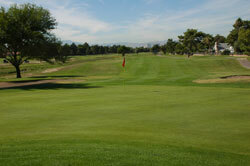 Information and reviews on Las Vegas golf courses, Las Vegas golf resorts, Las Vegas practice facilities and Las Vegas golf stores.